One of the finest surviving medieval aisled halls of the 13th century which was once part of the magnificent Winchester Castle. The castle was founded in 1067 by William the Conqueror shortly after his victory at the Battle of Hastings. In 1222 Henry III, with his love of architecture, began the construction of one of the earliest Gothic styled medieval halls. Admire the soaring Purbeck marble columns and beautiful Gothic pointed archways. Thomas Malory, the 15th century author of Le Morte D’Arthur, identified Winchester as the site of Camelot. 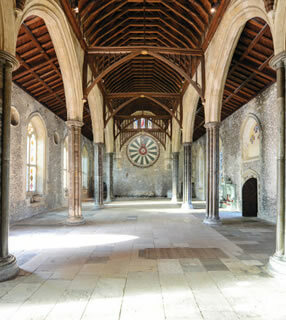 Here dominating the Great Hall, is the iconic Round Table - famously linked to the ancient legends of King Arthur and his Knights. Uncover its unique role and the influence it had on kings throughout history. From historians to poets, its mystique has captivated people’s imaginations for centuries. Meet the heroes and villains of the Great Hall’s past from Kings and Queens to judges and executioners. 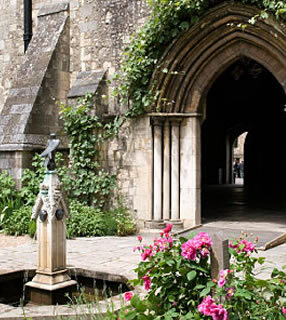 Relax in a recreated medieval garden named after the Queens Eleanor of Provence and Eleanor of Castile. Surround yourself by scented herbs and plants that were abundant in the 13th century. The garden features a tunnel vine arbour, turf seats and a fountain. 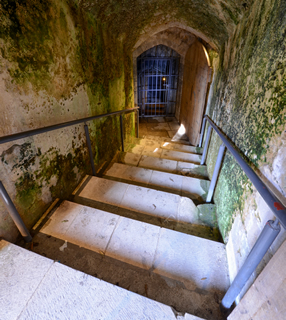 Glimpse the secret passages created to surprise an enemy or to return to the safety of the castle in times of battle and besiege. Take up a challenge and tackle one of our children’s trails of villains, heroes and ghosts. Collect from our welcome desk. Prices are from 50p. Browse in our Gift shop and treat yourself to bespoke and local gifts.